The Shambhala centre is open every Wednesday evening at 7pm, offering meditation instruction, group sitting practice, as well as occasional short talks, videos, and discussion groups. If you are interested in learning how to meditate, it’s best to arrive a bit before 7pm. 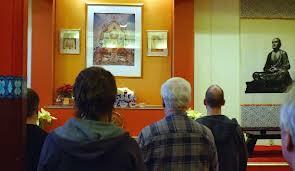 Meditation instruction is offered by an experienced meditation instructor at that time. Usually there is a group of five, six, or more people. Those who have had meditation instruction and are developing a regular practice often like to come for the group sitting meditation which goes from 7pm to 8pm. This session includes a short stretch break at 7:30pm. After the group sitting practice we offer tea and cookies in the community room. March 27 – Why Meditate? If Wednesdays don’t work for you, the Shambhala centre is also open every Tuesday evening at 7pm and Thursday mornings at 10am. Both of these on-going events include meditation instruction and group sitting practice. Everyone welcome!